Since becoming my official Building Technology Leader, I've been working to provide meaningful professional development to my colleagues. I often share a new tool or idea with my staff at our collaboration sessions or staff meetings. I have made it a priority to give teachers time to discuss, experiment, and play with new technology in my sessions, but everyone seems a little reserved and hesitant and I can tell that many are much more concerned with the impending morning bell and preparing for the day to come. I knew I could make professional development more engaging and memorable. Press 'play' below, read on, and see what I mean. 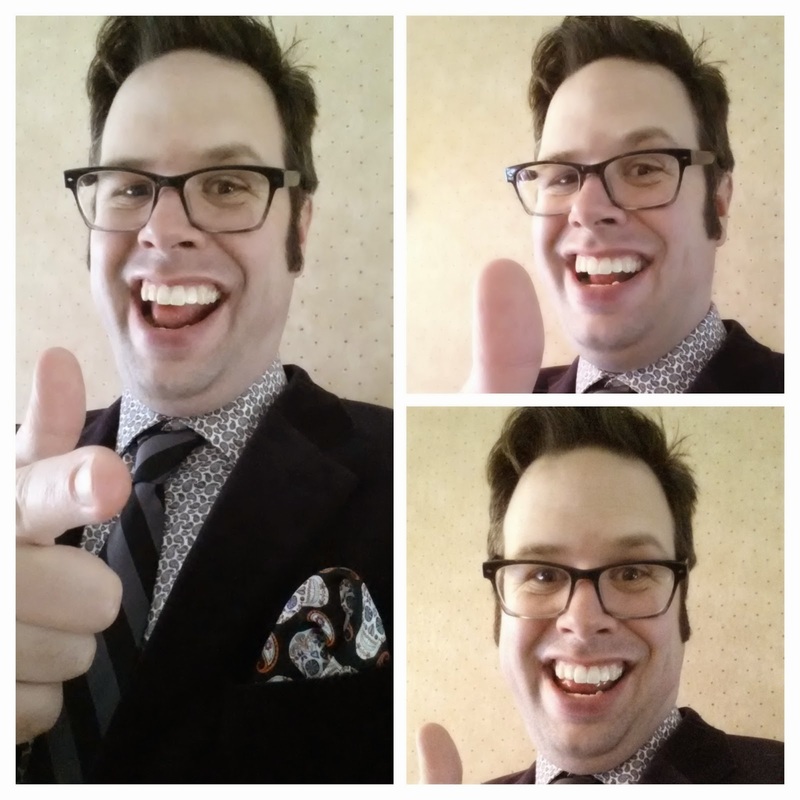 Welcome to Monday Morning Appy Hour! Care for a drink? It's okay, these mimosas are made with 7-Up, not champagne. Fire up that iPad and learn about a few new apps. Stemware & iPads: what a combination! The content of Monday Morning Appy Hour wasn't radically different from my other PD sessions. I shared SeeSaw, ChatterPix, Shadow Puppet EDU, and Telestory, discussed the importance of moving students from consumers to creators, and gave everyone some time to try the apps and generate ideas on how they could be used in the classroom. The attitude and level of participation, though, was a huge improvement from my past morning trainings. Everyone was having fun, and they were really discussing how they could use these tools in their classrooms. 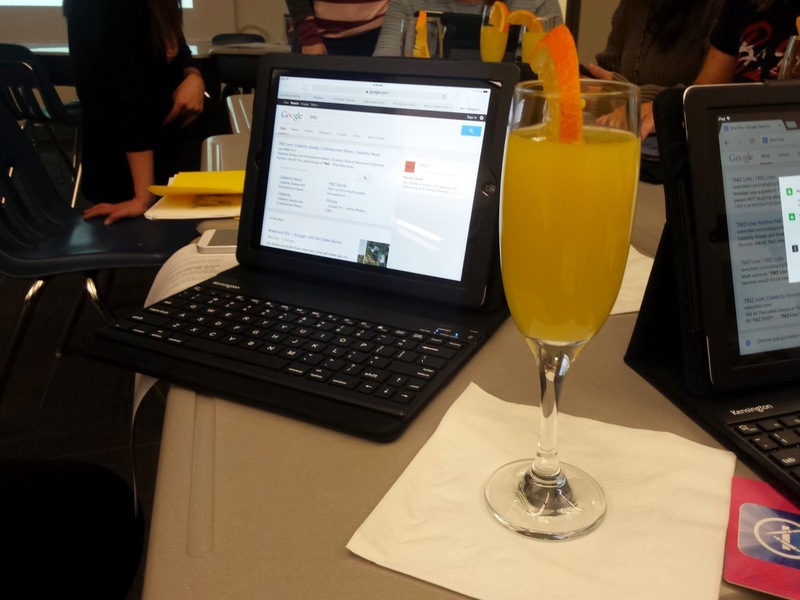 So, is providing refreshments the key to engaging PD? I don't think so. I transformed my classroom and broke everyone there out of the expected environment. I've done it before for my students by disguising myself as a signer of the Constitution and being my own substitute teacher for the day or starting class with kindergarten-style circle time for fifth graders, but I'd never transformed a presentation intended for other teachers. In Teach Like a Pirate, author Dave Burgess devotes an entire chapter to transformation. In the chapter, he asks a powerful question: "If your students didn't have to be there, would you be teaching in an empty room?" Teachers are busy; they have a lot to do to be ready for the day each morning. As much as they want to learn new technology, I know my PD sessions wouldn't be everyone's first choice for that precious before-school time. This session was optional, but most of my school's staff was there. In fact, after the first couple teachers came in, received their drink and heard the lounge music, they went and grabbed others because "Mrs. X just needs to see this!" It went from a training to an event. Making it fun loosened everyone up. They were excited to participate. The room was full of terrific conversations about giving students opportunities to create. I jumped in to support and tell some lousy jokes, but I refrained from actually doing any lounge singing. It was also a memorable experience. I feel like breaking away from the ordinary got the morning's content stuck in the participants' heads. Instead of having teachers ask me to remind them the names of the apps, they're coming to me to share how they've incorporated them into lessons and looking for support to take it a step further. I'm sure this is only my first foray into transforming professional development. I'm already thinking of themes for future sessions. And I'll keep you updated at I continue to experiment and refine. Thank you, thank you, and especially, thank you. Remember to tip generously. I'll be here all week!